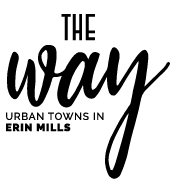 Just moments from the corner of Erin Mills Parkway and The Collegeway, The Way Urban Townhomes is a new home community in Mississauga that lets you live the way you’ve always wanted. A place where functional home designs, charming streetscapes and unrivalled convenience combine to create Mississauga’s best way home. The Way to Inspired Spaces.